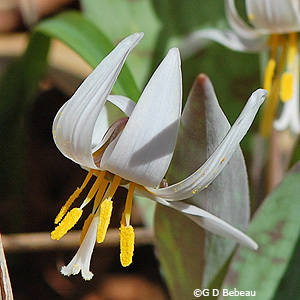 White Troutlily, Erythronium albidum Nutt. 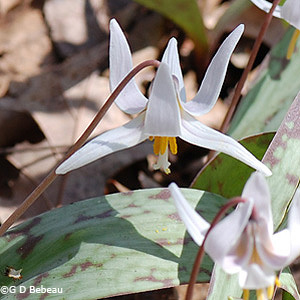 White Troutlily is a native perennial ephemeral of the early spring woods. Leaves are lanceolate, green, irregularly mottled (usually with reddish-brown), are basal, about 6 inches long and 2 inches across, and there are usually two on flowering plants and only one on non-flowering plants. Leaves have a smooth waxy surface. Flowers: The single white flowers (but may have a blue, pink or lavender tinge), appear at the top of a flowering stem (a scape) that is 2 to 7 inches high. They are nodding, about 1-1/2 inches long, have 6 petal-like tepals that at maturity, are highly reflexed. There is a yellow spot on the upper side of the tepal near its base, which will be difficult to see on the nodding flower. Flowers appear before the tree canopy leafs out. The filaments and anthers of the 6 stamens are yellow and the long single style is white with 3 re-curving lobes. Seed: If a flower matures, an ovoid 3-chambered seed capsule is held erect. Plants die back in summer. The best grouping to view are on the west path between stations 16 to 22. Eloise Butler's thoughts about this plant are given below. Habitat: White Troutlily forms extensive colonies via stolons sent out from the underground ovoid corm. New corms form at the ends of those stolons. They form dense groupings of which only a few will flower in any given year - research indicates about 1%. The best location has moist rich loam with dappled spring sunlight and then shade from the tree canopy when the the hot summer sun arrives. 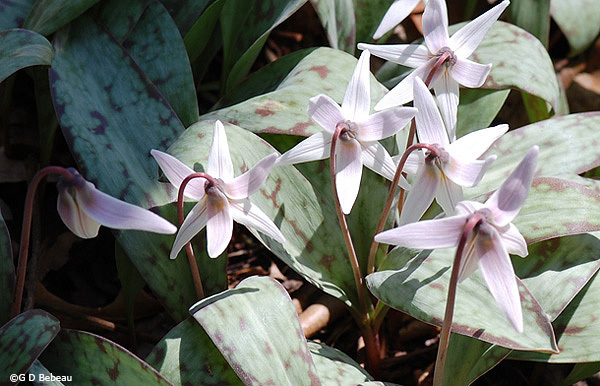 Names: The genus, Erythronium, is Greek and taken from a similar European species. The word is derived from ěrythrŏs, meaning 'red', referring to the mottled spots on the leaves. The species, albidum, means 'white'. The author name for the plant classification, ‘Nutt.’ is for Thomas Nuttall (1786-1859) English botanist who lived and worked in America from 1808 to 1841. On his many expeditions he collected many species that had been originally collected by Lewis and Clark but lost by them on their return journey. He also collaborated with French botanist Francois Andre Michaux (1770-1855) in Michaux’s 3 volume North American Sylva. The common name refers to the leaves being mottled like the sides of a trout. Another common name is Adder’s tongue refers to the same part of the plant as Eloise Butler explains below. Comparison: There are two species that are similar- Yellow Troutlily, E. americanum, where the flowers are yellow and E. propullans, the Minnesota Dwarf Troutlily where the flower and plant are much smaller but similar looking and only truly distinguishable when in flower as it has a much smaller flower with (usually) only 5 tepals or by examining the method of new bulb propagation where E. propullans is distinctively different. Above: The flowers above show full development with the yellow pollen on the spreading anthers clearly ready to disseminate and the 3 lobes of the white style reflexed. Below: Prior to the development shown above the anthers are arranged parallel to the style which is not yet fully developed. With the flower head nodding the delicate yellow spot at the base of the tepals is not noticed by observers. 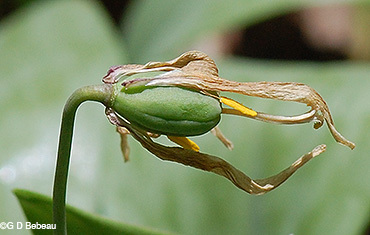 Below: The 3-chambered seed capsule forming with remnants of reproductive flower parts still attached. Below: Flowering plants will have two of the mottled leaves whereas non-flowering plants will have one. 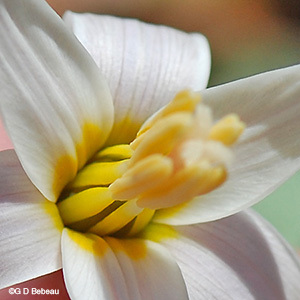 Notes: Troutlilies are not indigenous to the Garden. All have been brought in. It is not clear when and how Eloise Butler introduced the White Troutlily, but in a published writing from 1911 [Bulletin of the Minnesota Academy of Science, Sept. 1911.] 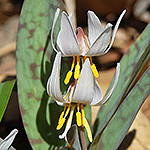 she stated that all three Minnesota species of troutlily were present in the Garden. On May 24, 1917 she recorded planting 9 of them that she obtained within Glenwood Park (which partially surrounded the Garden) and another from Crookston, Mn in 1919. White Troutlily was on Martha Crone's 1951 inventory of plants in the Garden at that time. She reported in her log planting it in 1934, '44, '48, and '52. Native to a wide swath of Minnesota, generally running from the SE to the NW in counties wooded with deciduous trees, and occasionally in St. Louis County, this is the most common of Minnesota's three species of Troutlily. In North America White Troutlily is found from the states of the central plains eastward to the coast, absent in Mass. and above and also absent in Florida North and South Carolina. In Canada it is known only in Ontario. 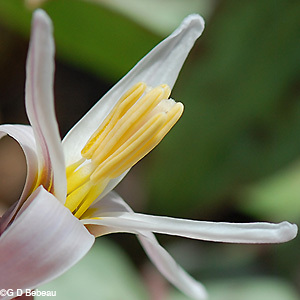 Lore and Uses: While E. albidum is a North American species, there are a number of species of Erythronium world-wide. The leaves are edible, often cooked and eaten as a vegetable. Uses go back to Roman times when fresh leaves, bruised and applied, would be used for relieving the pain of foot sores and corns. Pliny the Elder recorded that you could get purple flowers by soaking the plant root in red wine until it absorbed the red color of the wine. Teas made in combination with Horsetail grass (Equisetum hyemale) were considered good for internal inflammations. The leaves were used as potherbs, and the root as a cooked vegetable, nutritious and sweet, but difficult to dig.